The following characters are not allowed: \ud800 - uF8FF, \uFFF0 - uFFFF. Znodes are the main enitity that a programmer access. They have several characteristics that are worth mentioning here. When creating a znode you can also request that ZooKeeper append a monotonically increasing counter to the end of path. This counter is unique to the parent znode. The counter has a format of %010d -- that is 10 digits with 0 (zero) padding (the counter is formatted in this way to simplify sorting), i.e. "0000000001". See Queue Recipe for an example use of this feature. Note: the counter used to store the next sequence number is a signed int (4bytes) maintained by the parent node, the counter will overflow when incremented beyond 2147483647 (resulting in a name "-2147483648"). Zxid Every change to the ZooKeeper state receives a stamp in the form of a zxid (ZooKeeper Transaction Id). This exposes the total ordering of all changes to ZooKeeper. Each change will have a unique zxid and if zxid1 is smaller than zxid2 then zxid1 happened before zxid2. Version numbers Every change to a node will cause an increase to one of the version numbers of that node. The three version numbers are version (number of changes to the data of a znode), cversion (number of changes to the children of a znode), and aversion (number of changes to the ACL of a znode). 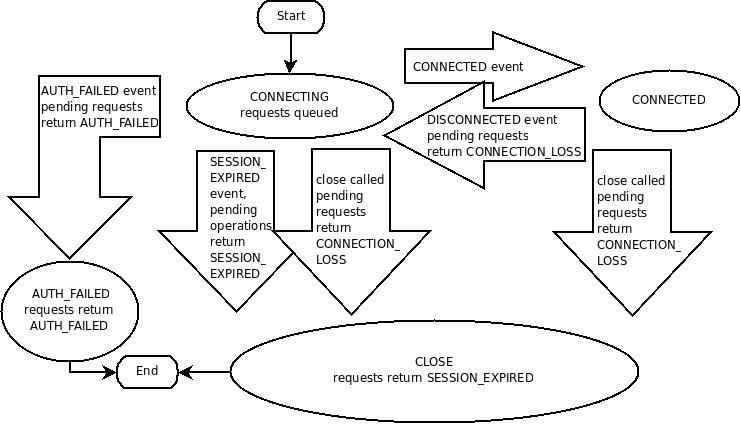 Ticks When using multi-server ZooKeeper, servers use ticks to define timing of events such as status uploads, session timeouts, connection timeouts between peers, etc. The tick time is only indirectly exposed through the minimum session timeout (2 times the tick time); if a client requests a session timeout less than the minimum session timeout, the server will tell the client that the session timeout is actually the minimum session timeout. Real time ZooKeeper doesn't use real time, or clock time, at all except to put timestamps into the stat structure on znode creation and znode modification. czxid The zxid of the change that caused this znode to be created. mzxid The zxid of the change that last modified this znode. pzxid The zxid of the change that last modified children of this znode. ctime The time in milliseconds from epoch when this znode was created. mtime The time in milliseconds from epoch when this znode was last modified. version The number of changes to the data of this znode. cversion The number of changes to the children of this znode. aversion The number of changes to the ACL of this znode. ephemeralOwner The session id of the owner of this znode if the znode is an ephemeral node. If it is not an ephemeral node, it will be zero. dataLength The length of the data field of this znode. numChildren The number of children of this znode. One-time trigger One watch event will be sent to the client when the data has changed. For example, if a client does a getData("/znode1", true) and later the data for /znode1 is changed or deleted, the client will get a watch event for /znode1. If /znode1 changes again, no watch event will be sent unless the client has done another read that sets a new watch. Sent to the client This implies that an event is on the way to the client, but may not reach the client before the successful return code to the change operation reaches the client that initiated the change. Watches are sent asynchronously to watchers. ZooKeeper provides an ordering guarantee: a client will never see a change for which it has set a watch until it first sees the watch event. Network delays or other factors may cause different clients to see watches and return codes from updates at different times. The key point is that everything seen by the different clients will have a consistent order. The data for which the watch was set This refers to the different ways a node can change. It helps to think of ZooKeeper as maintaining two lists of watches: data watches and child watches. getData() and exists() set data watches. getChildren() sets child watches. Alternatively, it may help to think of watches being set according to the kind of data returned. getData() and exists() return information about the data of the node, whereas getChildren() returns a list of children. Thus, setData() will trigger data watches for the znode being set (assuming the set is successful). A successful create() will trigger a data watch for the znode being created and a child watch for the parent znode. A successful delete() will trigger both a data watch and a child watch (since there can be no more children) for a znode being deleted as well as a child watch for the parent znode. Created event: Enabled with a call to exists. Deleted event: Enabled with a call to exists, getData, and getChildren. Changed event: Enabled with a call to exists and getData. Child event: Enabled with a call to getChildren. ZooKeeper supports pluggable authentication schemes. Ids are specified using the form scheme:expression, where scheme is the authentication scheme that the id corresponds to. The set of valid expressions are defined by the scheme. For example, ip:172.16.16.1 is an id for a host with the address 172.16.16.1 using the ip scheme, whereas digest:bob:password is an id for the user with the name of bob using the digest scheme. ADMIN permission also has a special role in terms of ACLs: in order to retrieve ACLs of a znode user has to have READ or ADMIN permission, but without ADMIN permission, digest hash values will be masked out. auth is a special scheme which ignores any provided expression and instead uses the current user, credentials, and scheme. Any expression (whether user like with SASL authentication or user:password like with DIGEST authentication) provided is ignored by the ZooKeeper server when persisting the ACL. However, the expression must still be provided in the ACL because the ACL must match the form scheme:expression:perms. This scheme is provided as a convenience as it is a common use-case for a user to create a znode and then restrict access to that znode to only that user. If there is no authenticated user, setting an ACL with the auth scheme will fail. x509 uses the client X500 Principal as an ACL ID identity. The ACL expression is the exact X500 Principal name of a client. When using the secure port, clients are automatically authenticated and their auth info for the x509 scheme is set. The ZOO_OPEN_ACL_UNSAFE is completely open free for all ACL: any application can execute any operation on the node and can create, list and delete its children. The ZOO_READ_ACL_UNSAFE is read-only access for any application. CREATE_ALL_ACL grants all permissions to the creator of the node. The creator must have been authenticated by the server (for example, using “_digest_” scheme) before it can create nodes with this ACL. This operation returns a node’s ACL info. The node must have READ or ADMIN permission set. Without ADMIN permission, the digest hash values will be masked out. Here is a sample code that makes use of the above APIs to authenticate itself using the “_foo_” scheme and create an ephemeral node “/xyz” with create-only permissions. Sequential Consistency : Updates from a client will be applied in the order that they were sent. Atomicity : Updates either succeed or fail -- there are no partial results. Single System Image : A client will see the same view of the service regardless of the server that it connects to. Timeliness : The clients view of the system is guaranteed to be up-to-date within a certain time bound (on the order of tens of seconds). Either system changes will be seen by a client within this bound, or the client will detect a service outage. Sometimes developers mistakenly assume one other guarantee that ZooKeeper does not in fact make. This is: * Simultaneously Consistent Cross-Client Views* : ZooKeeper does not guarantee that at every instance in time, two different clients will have identical views of ZooKeeper data. Due to factors like network delays, one client may perform an update before another client gets notified of the change. Consider the scenario of two clients, A and B. If client A sets the value of a znode /a from 0 to 1, then tells client B to read /a, client B may read the old value of 0, depending on which server it is connected to. If it is important that Client A and Client B read the same value, Client B should should call the sync() method from the ZooKeeper API method before it performs its read. So, ZooKeeper by itself doesn't guarantee that changes occur synchronously across all servers, but ZooKeeper primitives can be used to construct higher level functions that provide useful client synchronization. (For more information, see the ZooKeeper Recipes. [tbd:..]). Synchronous calls may not return in the correct order. For example, assume a client does the following processing: issues an asynchronous read of node /a with watch set to true, and then in the completion callback of the read it does a synchronous read of /a. (Maybe not good practice, but not illegal either, and it makes for a simple example.) Note that if there is a change to /a between the asynchronous read and the synchronous read, the client library will receive the watch event saying /a changed before the response for the synchronous read, but because the completion callback is blocking the event queue, the synchronous read will return with the new value of /a before the watch event is processed. Run ant compile_jute from the ZooKeeper top level directory (*.../trunk*). This will create a directory named "generated" under .../trunk/zookeeper-client/zookeeper-client-c.
Change directory to the*.../trunk/zookeeper-client/zookeeper-client-c* and run autoreconf -if to bootstrap autoconf, automake and libtool. Make sure you have autoconf version 2.59 or greater installed. Skip to step**4**. If you are building from a project source package, unzip/untar the source tarball and cd to the* zookeeper-x.x.x/zookeeper-client/zookeeper-client-c* directory. If you are building a multithreaded client, compile with -DTHREADED compiler flag to enable the multi-threaded version of the library, and then link against against the zookeeper_mt library. If you are building a single-threaded client, do not compile with -DTHREADED, and be sure to link against the_zookeeper_st_library. Set your Java max heap size correctly. It is very important to avoid swapping. Going to disk unnecessarily will almost certainly degrade your performance unacceptably. Remember, in ZooKeeper, everything is ordered, so if one request hits the disk, all other queued requests hit the disk. To avoid swapping, try to set the heapsize to the amount of physical memory you have, minus the amount needed by the OS and cache. The best way to determine an optimal heap size for your configurations is to run load tests. If for some reason you can't, be conservative in your estimates and choose a number well below the limit that would cause your machine to swap. For example, on a 4G machine, a 3G heap is a conservative estimate to start with. Barrier and Queue Tutorial : The excellent Java tutorial by Flavio Junqueira, implementing simple barriers and producer-consumer queues using ZooKeeper. ZooKeeper Recipes : Pseudo-level discussion of the implementation of various synchronization solutions with ZooKeeper: Event Handles, Queues, Locks, and Two-phase Commits.